Last Friday we talked about providing a better hotel guest experience for tech-savvy travelers, starting with attention-grabbing digital signage in the lobby. 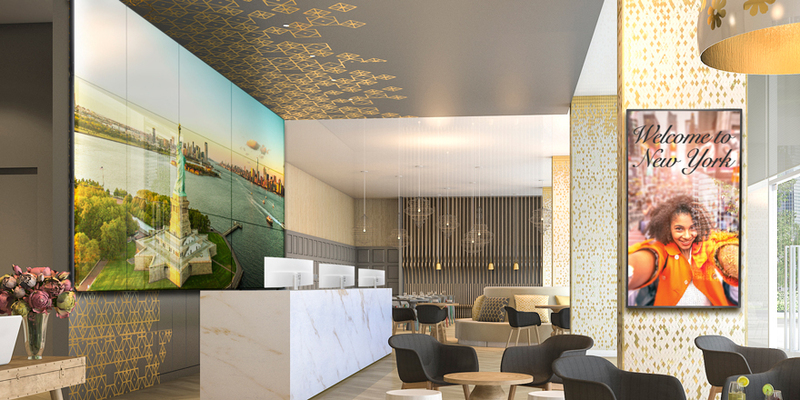 In fact, having a network of digital signage throughout the common areas can give the property a cutting-edge appearance and engage guests in many ways. Let’s think about the kinds of content a hotel might want to run on that digital signage. Welcome guests and guide them with digital maps and directories. As guests make their way to and from their rooms, touch screen displays in the common areas provide a familiar interface for them to navigate through your hotel. If visitors have arrived for a conference, small-format signage in the hallways can help get them to the right place at the right time. Manage your meeting room schedules in real time from a desktop PC, laptop, tablet or smart phone. Use commercial-grade signage TVs for news and sports, and integrate your menus, promote daily specials, announce happy hours, deliver important alerts and more. In your fitness center, use video walls, large-format 4K UHD displays or hospitality televisions to offer a variety of interactive fitness classes 24/7. We partner with Fitness on Demand™, a leading delivery platform of hundreds of premium high-definition workout classes by the industry’s best instructors. Your guests can experience a diverse array of fitness classes at their convenience. Use attention-grabbing stretched displays and razor-thin displays to set the ambience for a relaxing and rejuvenating escape. Include tranquil images, promote, cross-sell and upsell services and spa products, showcase the latest hair trends for inspiration, and introduce the stylists and massage therapists with their pictures and short bios. Sell advertising space on your digital signage to inform guests about local tourist attractions, restaurants, nightclubs, car rental services and other businesses of interest. Running digital signage in hotel common areas is easy with a platform such as webOS for Signage. WebOS for Signage works with the displays’ embedded System-on-Chip (SoC) and enables high-quality content creation and remote management, while eliminating the need for media players and onsite servers. Next Friday we’ll take you to the guest room, where tech-savvy, device-enabled travelers can enjoy an accommodating and memorable entertainment experience that’s second to none. See you then. 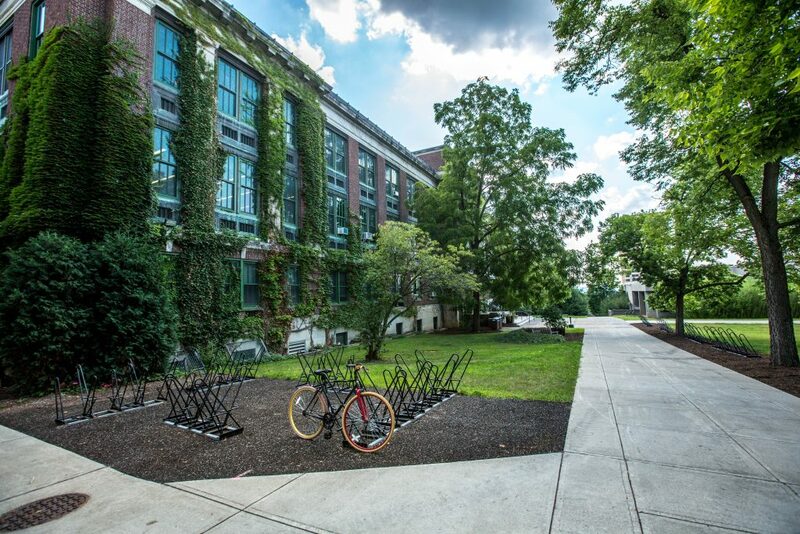 When prospects tour your school in the summer, they’re facing an empty, unwelcoming campus. Choosing which school to attend is a huge step in a student’s future, and they have to know they’ll be happy there for the next four years. Don’t let prospects walk away unconvinced. 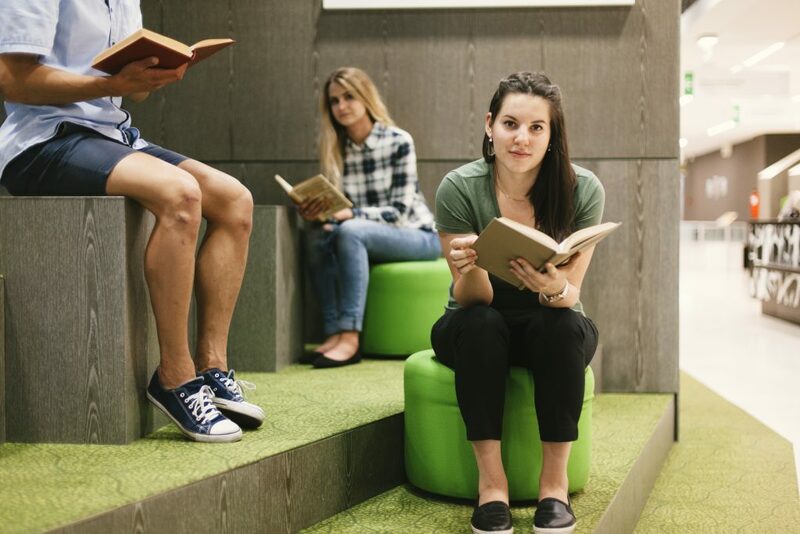 Whether prospective students have already received acceptances, or are evaluating schools to apply to, you need to make a great first impression to ensure their enrollment. Don’t lose students at the last step of the process because of the season. When deciding which school to attend, I wanted someplace I could envision myself. Because I visited in the summer when much of campus was closed it felt deserted and uninviting. Students that get this impression from your school are enrolling elsewhere. Eliminate this issue by using new technology to display a vibrant campus and inspire touring prospects. Advertise what’s open during fall and winter semesters that may not be open over the summer, such as your bookstore. Display what your campus looks like when fall and winter semesters are in session. Show all your school has to offer outside the classroom by advertising upcoming events and activities. Your cafeteria is the heart of your school – promote all menu options with images that whet appetites. An empty campus over the summer term means new opportunities. Digital signage allows you to show all your school has to offer. From typical student hang-outs to the possibilities of campus life, showcase an inviting school with lots of social opportunities. Make your tour the best it can be year-round. As we saw at HITEC this week, improving the guest experience is key to creating a standout hotel. Hospitality professionals browsed the show floor looking for solutions: What do hotel guests want and how can we better provide it? What do we know about today’s hotel guests? From our perspective we know that many are tech-savvy. They’re accustomed to incorporating digital technology into all aspects of their lives – from mobile phones, tablets and laptops, to smart TVs and voice-activated home assistants. They depend on display screens for information and appreciate the immediate gratification of a digital experience. And they bring this expectation with them when they travel. To meet and exceed the expectations of these guests, hotels are making the most of multi-featured, commercial-grade hospitality TVs in the guest rooms, and innovative digital signage solutions in the common areas. The end goal is to make it easier for hotels to serve their guests and communicate the messaging that will make their stay more enjoyable. Let’s start with the lobby. A hotel lobby makes a strong first impression. It’s the first thing guests see, and it’s where innovative digital signage displays can create a wow factor and help define the hotel’s brand by communicating its strengths, values and services. The latest display form factors are attention-grabbing, fit just about anywhere, and content can be easily managed from a central location. Video walls, touch screens, razor-thin screens, curved screens, stretched screens and transparent screens can all be incorporated into a property-wide digital signage network. Digital signage can maximize opportunities for guest-driven interactivity that can result in requests for more information, reservations at the restaurant and booking of spa services. Common-area displays give the property a cutting-edge appearance and can engage and inform guests in many ways. Next week we’ll dive into the types of content a hotel might want to run on digital signage throughout the property. Stay tuned. InfoComm 2018 was fantastic. Plenty of excitement at the LG booth, and some awards too, including a 2018 Commercial Integrator BEST Award and a 2018 Digital Signage Magazine Best of Show Award for our Transparent Color LED Film. 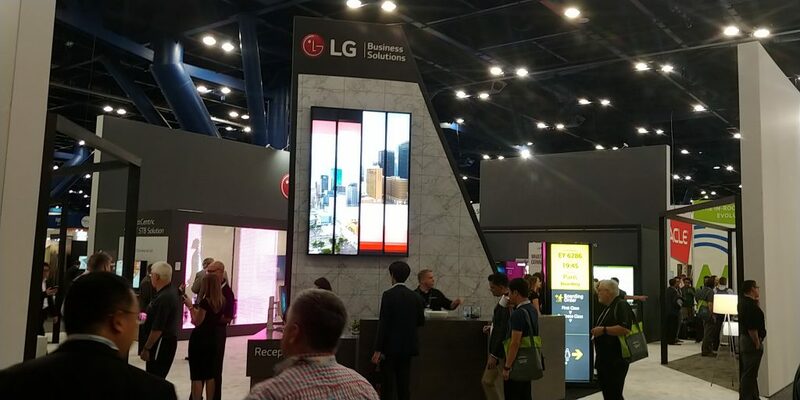 Year after year, LG continues to bring to market new innovations that offer end users and systems integrators alike opportunities to drive business and increase their bottom lines. If you weren’t at InfoComm, or if you were and want to share some of the excitement with your colleagues, the video below will come in handy. It’s a full LG booth tour hosted by Gary Kayye, founder of rAVe [Publications], and Garry Wicka, LG’s head of marketing. You’re in for a treat. Sit back and enjoy.